Dreamwell Theatre invites you to explore the interconnected terrain of loss, grief, and creativity. How does tragedy affect the way we think? How do artists deal with personal and collective tragedy? How do they create new voices that speak to an awareness altered by tragedy? These are only a few of the questions explored from an artist’s point of view in a collaborative and creative work of monologues, set pieces, and short scenes created by the actors. Two years ago, when I was asked to become a member of Dreamwell Theatre as the artistic director, I had two immediate and concrete goals. The first was to provide a space for local authors to workshop and present new works. Later this year, our festival of one act plays will begin delivering on that promise. The second goal was to create an ensemble of actors that would have the skills, tools, and trust necessary to create an original theatrical experience. Using theories and practical tools I had the fortune to learn working with the Living Theatre and New York University’s Experimental Theatre Wing, I sought to our group a common vocabulary and the space to stretch themselves. Dreamwell Theatre in Iowa City is less than five years old, and in some ways is still a fledgling organization. A small company that performs in a church basement, it still has quite a journey ahead of it to get to the sizable budgets and technical wizardry usually associated with professional theater companies. But that’s not the only thing that sets this group apart, and a ticket to see the group’s latest show, Wake, is the perfect way to see what the real difference is. Their commitment to be “a theatre of exploration” has resulted in The Actor’s Laboratory, where Wake has emerged as its collaborative creation. Technically a premiere, Wake is so unlike a traditional show that the term for a first production run seems almost incongruous. A collection of monologues and scenes that focus on the artistic response to tragedy, the show returns again and again to censorship in all its forms. While not strictly related to the Sept. 11 terrorist attacks, the opening sequence offers a grim reminder of how tragic events affect people in many ways. References to the Challenger explosion and to the assassination of Prime Minister Rabin, among others, echo across the faces of shocked performers who try to articulate their responses. The experiences of World War II POWs is featured in another series of vignettes where the acting is stronger than the writing, and the sociopolitical oppression of women in fundamentalist religious states is highlighted in a monologue where the opposite is true. Another scene involves the telling of a Dr. Seuss-like children’s story about intolerance, and there are others as well, but the strongest single piece is a series of scenes about actors who try to mount a production of Hamlet against ever-increasing government opposition. The use of the famous “To be, or not to be…” speech creates the perfect, wonderfully accessible metaphor for a group of performers who face frightening “slings and arrows,” and it gives this part of Wake true promise. This part of Act Two has the potential to eventually be a standalone work with enough of a traditional framework to reach general audiences with its message. This piece and some of the censorship monologues offer the strongest acting in the show, though some of the other sections included uneven performances. A small number of chirpy musical interludes came across as downright silly, but thankfully were short interruptions of more serious text. As a 90-minute experimental work with no linear structure and no cast list assigning character names – not even a list of scenes to help an audience get a handle on the presentation – “Wake” probably won’t appeal to a broad general audience. It is, however, earnest and emotional commentary on the quandary that faces artists and writers every time government intervention and/or jingoistic “patriotism” threatens to affect their work. Dreamwell’s artistic director Matthew J. Brewbaker and the Actor’s lab have begun a process of exploration, and have invited audiences along for the thought-provoking journey. This play was chosen as Best Satire by Ruby Nancy of the Quad City Times! Dreamwell Theatre in Iowa City, which produced Some Things You Need to Know Before the World Ends (A Final Evening with the Illuminati), earns this “Ruby” for a show that was also so much more than satire. With jabs at conventional religion, societal norms and public policy – just to name a few – this show was as edgy and thought-provoking as it was funny and sad. Again, a show too far out there for some, but work of this depth and quality adds rich texture to the slate of shows local and regional audiences have to choose from. And that’s a bonus that enhances all of our lives. Before we started the Writers’ Joust/Skirmish, we had Original Copy, which showcased local work. 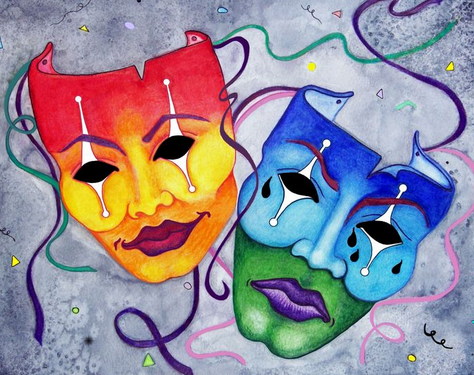 Three one acts and three monologues created an original theatrical production. Mr. Wu suggests a unique method for a group of artists to become famous without any talent… or effort. This play also explores the themes of relationships and roles, this time within the family. “This is a group of people who aren’t related by blood, but somehow have come together as a family unit,” said Miessler-Kubanek. The play takes a fun and light-hearted look at the roles people take within a group, and questions whether these roles are created by the person or the group. A friend and I were discussing Don DeLillo recently and I commented that DeLillo is an author whose work splits people neatly into two camps- those who love it and those who loathe it. My friend, who has never taken the plunge into a DeLillo novel, said she beonged to a third camp- those who are afraid of it. DeLillo’s second play, Valparaiso, will give audience members plenty to be afraid of when Dreamwell Theatre’s production, the Iowa premiere, opens on Sept. 20. But this strong cast’s nuanced performances, as revealed in an Aug. 20 rehearsal, will help the audience navigate DeLillo’s dense and often confusing language to get at the dread at the play’s center. As a result, Valparaiso will satisfy both DeLillo’s fans and those who are engaging the author’s work for the first time. And those who hate DeLillo’s work? Well, Valparaiso offers them a great chance to reconsider, but probably won’t change their minds. All of DeLillo’s major themes are on display in Valparaiso, including how personal decision making is manipulated in crowds, how technology and media have recreated our values and perceptions, and how the signified and the signifier continue to drift apart. Under Scot West’s skillful direction, these themes are brought to life in ominous and disturbing ways. Valparaiso traces the media stardom of Michael Majeski (played by Matt Brewbaker), a man who leaves his home one morning to fly to Valparaiso, Ind., but ends up heading first towards Valparaiso, Fla. and ultimately arrives in Valparaiso, Chile. The play follows him though a series of interviews during which he tells his story over and over, with very little variation in the words, but with a wealth of variation in the tone. In the first act, a series of interviewers (all played by David Pierce and Candie Wuehle) takes him through the story, subtly shaping it along the way. Still several weeks from opening night and not completely free from the script, Brewbaker turned in a performance that was already following a clear emotional arc and should only grow more textured as the rehearsals continue. Brewbaker will have to be at the top of his game in the second act, which finds Michael and his troubled, pregnant wife Livia (Kara Ewinger) as guests on a talk show of the Jenny Jones variety. The show is hosted by Delfina Treadwell (Kristy Hartsgrove), who along with sidekick Teddy Hodell (Adam Fauser), creates an intimate mood that is both confessional and confrontational. She elicits the couple’s deepest secrets via a carrot-and-stick approach and drives the play towards its extremely dark conclusion. Both Hartsgrove and Fauser were already delivering performances bordering on the brilliant, capturing the stereotypical aspects of their character’s types, but also carving out individual personalities that were equally engaging and loathesome. Brewbaker and Ewinger seem up to the challenge, however, as does a vaguely menacing chorus portrayed by Ed Hally, Madonna Smith and Barbara Ritchison, and the second act of Valparaiso has the potential to be stunning. Both cast and crew still had a number of challenges to overcome prior to opening night, tanging from small but key things like enunciation (nailing the word “erotomaniacal”, for example) to large issues like moving the production from its rehearsal home at the Wesley Center to its performance space at the Unitarian Universalist Church. A great deal of technical work remains to be done, as well, because the play calls for a fairly complicated array of live and taped images to be “broadcast” on various screens during the production. Talking with nearly all of the actors after the rehearsal, however, it was clear that this production is firmly grounded in the careful consideration each performer has given to the creation of his or her role, as well as West’s overall vision. This is a cast engaged in more than learning lines and blocking; rather, each member has thought deeply about the motivations of his or her character and about the play’s ultimate questions concerning personal experience and the mutability of that experience in the face of pervasive media intrusiveness. Dreamwell delivers another avant-garde play. Dreamwell Theatre in Iowa City is closing out its 2002 season with Eric Overmyer’s On The Verge, an amusing, thoughtful work about three Victorian female explorers who find themselves traveling through time as well as space. Subtitled The Geography of Yearning, this show is actually a series of vignettes and short monologues, though the work as a whole has a thread of story like plays with more linear structures. And in some ways the show is classic Dreamwell, since its structure, humor and subject matter are all out of the ordinary. Dressed in long, bustled skirts and high-necked blouses, and outfitted with backpacks and an amazing amount of equipment – none of it carried by porters, mind you – the three women set out together to explore and understand a place they call Terra Incognita, and along the way they bicker, brag and entertain each other with tales of earlier adventures. The tone is light, with characters that are frequently carefree, occasionally pensive and accidentally profound. Madonna Smith is feisty and funny as Fanny Cranberry, a sassy veteran explorer who leaves a beloved husband behind every time she begins a new expedition. Smith’s ability to deliver emotionally charged material turns her line readings of letters Cranberry writes into stunning little bits of theater that will tear at your heart. She’s also droll and oblivious by turn, and an occasional reactionary huff works well for this role. As Alexandra Cafluffle, the young expert on ice and mountain terrain who also dreams of life as a poet, Candie Wuehle is another hilarious performer. Her deadpan delivery of ridiculously funny rhymes and outrageous malapropisms is great fun, and she attacks whining, tropical greenery and fashion revolution with equal gusto. Both Cranberry and Cafluffle are, in some ways, simply foil for Mary Baltimore, the central character. Victoria Krajewski, as Baltimore, turns in a nuanced performance that adds richness to the heart of this thought-provoking play. Her expressive face and voice are tools she puts to perfect use in this gentle, indomitable role. Monologues, spoken as though they are thoughtful journal entries, reveal her character as determinedly optimistic and drawn endlessly forward by a search for something indefinable. Krajewski’s subtle, low-key work packs a major emotional wallop you won’t forget. Scot West also does fine work in a number of smaller roles, giving each of them personality and definition as required, and he earns some big laughs for his well-done walk-ons. On The Verge is set, largely, on a bare stage, and first-time director Kristy Hartsgrove exploits that stark intimacy with strong performers and simple properties. Matthew Brewbaker’s excellent work on a host of rich, high-impact light cues also makes the most of the performance space. A fine piece of theater, this show has the power of a drama and the levity of first-rate comedy, and Dreamwell deserves kudos for the excellent work and – refreshingly – the group’s willingness to tackle material we haven’t already seen often enough to half-memorize.